This was our last day in Dallas and Marsh and Kary had another great day planned for us. Marshall and Mitch woke up very early to go golfing, the rest of us went to breakfast. 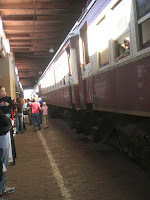 After that we went to board an antique train for a ride to the Fort Worth Stock Yards. It was an hour and half trip and we had fun visiting and waving at the people and cars on the street. We were blessed with a gorgeous day. Sunny, 70 degrees, perfect. Marshall claims to have planned the weather as well. He thinks of everything. 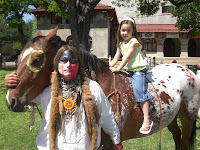 When we arrived at the Stock Yards, Brandon and I went our own way because we had some serious shopping to do. 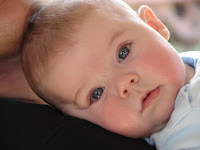 We hadn't purchased a single thing for our kids and I don't know about you, but when we go somewhere without our kids, they expect some "stuff" when we get back. We picked out cowgirl hats and Texas t-shirts for the girls. Ethan got a cap gun which he adores. He also got a gun case for his bb-gun. Now try not to vomit when you hear this (especially you Danyelle), but we also got him a bolo-tie (sp?) I know those things are the tackiest things in the whole world, but they are very Texas, and Brandon's grandpa wore one, so we thought it would be a very sentimental souvenir. I am just hoping that he doesn't fall in love with it though, because if he is 14 years old going to stake dances wearing a bolo-tie, I might have to shoot myself. Scratch that. I WILL have to shoot myself! 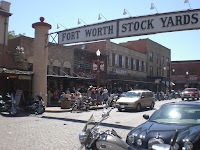 The stock yards are pretty cool, very old west style. 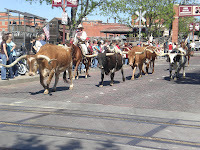 At 4:00pm they lead a herd of longhorn cattle down the mainstreet and there are restaurants, shops, touristy things. After we were all done shopping and checking things out we met back up with the family and boarded the train again for the ride back. When we got back we were all ready for dinner, so Marsh and Kary took us to another great restaraunt. It was called BJ's and it was a sports themed place, but the menu was very much like Cheesecake Factory. They even had the avacado egg rolls, which my Mom and I insisted on. They were delicious. This was our last day in Dallas and it was much more laid back and relaxing and we just had such a great time visiting and playing with the kids. 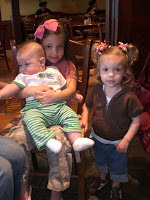 I took a lot of pictures on this trip, and many of them were of my neices Amelia and Elyse, and of my nephew Jack. They are so cute and so fun to be an aunt to. The next morning we had to wake up very early to catch our plane, and so we said our goodbuys that night. We had such a wonderful time in Dallas and we are so grateful that Marsh and Kary planned such a fun trip for us. We look forward to visiting them again after they are settled into their new area. That was our trip to Dallas. I have a few more stories and observations to share, so stay tuned for more about Dallas next week. Have a great weekend!